The Nuclear Free Irish Sea Flotilla, a grouping of individual concerned Irish and British sailors, was today unveiled in Poolbeg Yacht Club by Dublin's Lord Mayor, Councillor Dermot Lacey to the strains of classical music by violinist Cora Venus Lunny. Speakers included Jim Corr of The Corrs, Nuala Ahern MEP and Labour Party TD Mr Eamon Gilmore. 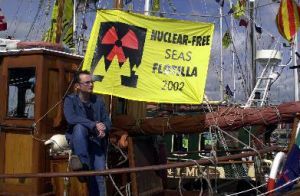 The Flotilla, currently standing at approximately 20 yachts, intends to peacefully protest at sea a cargo of rejected plutonium fuel currently on route from Japan to Sellafield in the UK and expected in the Irish Sea in the next two weeks. "We are not willing to stand idly by and allow these shipments to travel through the world's oceans unchallenged," said Paul Barrett, skipper of the 47 foot yacht Tuscair. "These shipments put us all at risk. This madness has to stop." According to a spokesperson the Flotilla has no intentions of breaking the law, of causing any hazards to navigation or of putting any vessel or person at risk, rather the reverse. The Flotilla will peacefully protest the risks, threats and arrogance of nuclear transports at sea. "What else can we do? We would all prefer not to have to do this, but what would we say to our children if the worst came to the worst? I just could not say 'I didn't care enough to take action'," said skipper Cormac Kavanagh. A similar launch also took place in Fishguard in Wales today where sailing craft and canoes took to the water and local MPs and Welsh Assembly members attended to show their support for the Flotilla. 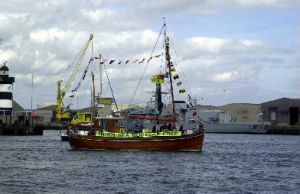 The Irish Sea Flotilla is part of a global movement of seafarers opposed to nuclear transports. This plutonium transport has already been opposed in the South Pacific and the Tasman Sea with a symbolic flotilla protest off Cape Horn. 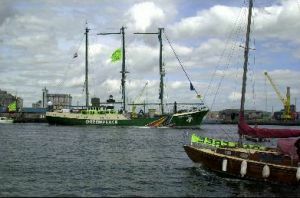 The Irish Sea Flotilla is to invite the Irish Government to join with them in their efforts to stop nuclear transports at sea. The Flotilla will stand by in various ports awaiting information that the nuclear transport is about to enter the Irish Sea before sailing to rendezvous at an as yet undisclosed position.